In 1943, Venezuela surcharged four stamps from earlier issues, creating a set which was sold primarily to stamp collectors (Scott #384-87). 6,000 sets were issued, and Scott '12 prices the unused set at $137.50 . It is highly probable that most, if not all, of the sets still exist. 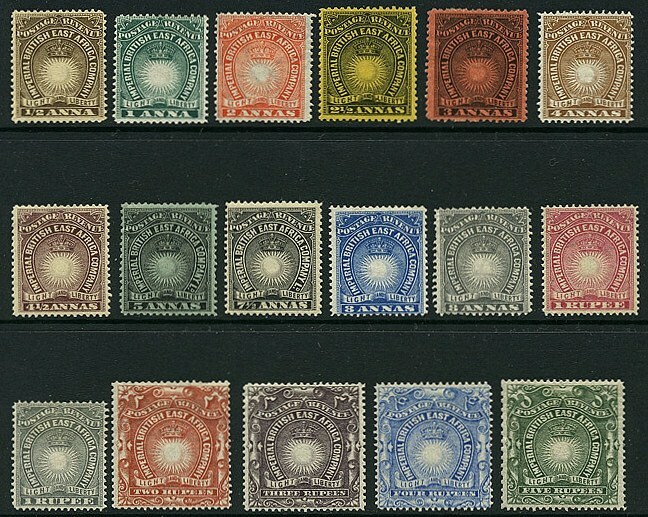 Nevertheless, its low issuance quantity makes it a good bet on the growth of interest in stamps of Venezuela as well as those of Latin America in general. I encourage those interested in learning more about investing in stamps to view my book, A Guide to Philatelic Investing ($5 on Kindle). In 1919, New Zealand surcharged thirteen stamps of its 1909-19 issues for use in its dependency, the Cook Islands (Scott #48-60). To facilitate use of the stamps by the native islanders, the surcharge utilized Cook Islands Maori language, also known as Rarotongan, or Te reo Ipukarea, literally "the language of the Ancestral Homeland." The set is commonly known as the "Polynesian Surcharge Issue", although this is imprecise, since there are some 40 Polynesian languages. 20,000 sets were issued, and Scott '12 prices it unused at $27.90. 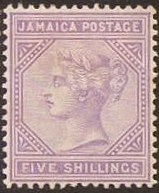 The engraved stamps of this set (Scott #53-57, 59-60) were produced with two different perf. sizes per sheet, perf. 14X14 1/2 and 14 x 13 1/2, and pairs and blocks of four containing examples with both perf sizes are desirable. The set should do well based on their appeal to British Commonwealth collectors and demand from New Zealand. The fact that knowledge is power applies to many aspects of life, and it especially holds true when it comes to the market for collectibles, including stamps. 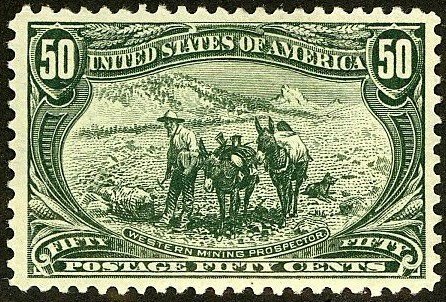 One of the most exciting aspects of the hobby is that every once in a while, one may find scarce varieties priced as normal stamps. with messages on t he back (gum side) of the stamps instructing hunters to sign them on the front. From 1946 to 1950 (for Scott #RW13-17), "PL. 47510" (Plate #47510) was printed on the back of the selvedge attached to one stamp in each sheet (Position 24 on the upper right pane). The Duck stamps of this period were issued in sheets of 4 panes, each of which contained 28 stamps. 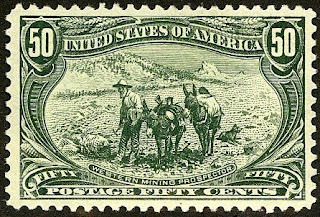 Hence, for each of these five issues, only one out of every 112 stamps was attached to the selvedge bearing the plate number printed on the gum side. Until recently, these stamps were ignored by the vast majority of duck stamp collectors, who now collect them as plate blocks of six and plate number singles. Album publishers also ignored the varieties. 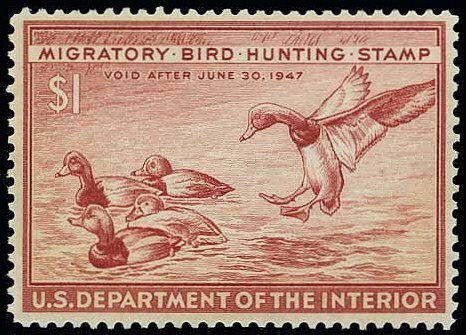 I've discussed these stamps with several dealers who specialize in duck stamps, and the consensus among them is that perhaps 2%-4% of the initial quantity remain, at most. The Scott U.S. 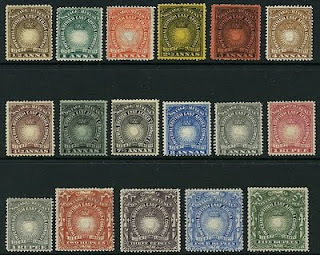 Specialized Catalog describes and prices the plate blocks of these stamps in a note following RW12. 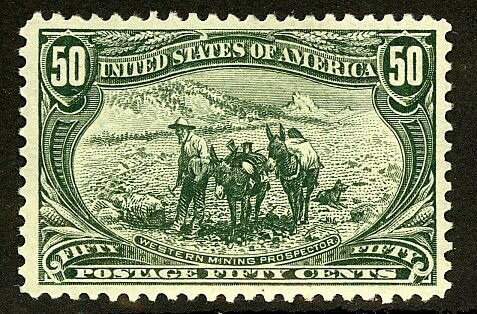 I believe these positional varieties to be an excellent investment if purchased at their current catalog values, and advise collectors to keep a lookout for the varieties priced as the normal stamps by dealers who are ignorant of them. The Duck Stamp collecting community is interesting because it represents an atypical crossover market which includes collectors of general U.S. stamps and U.S. Revenues, along with collectors of Duck hunting memorabilia and Wildlife art. 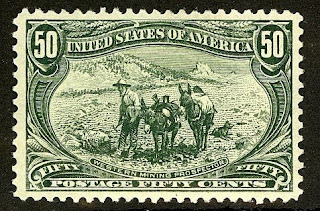 Because the sales of the stamps protect wildlife habitats, it may be considered a "green" collectible, and Duck stamp collecting is actively promoted by the Fish and Wildlife Service. There are currently about 8,000 to 10,000 "serious" Duck stamp collectors in the U.S., and many others who buy them to them to fill spaces in their general U.S. albums. The Imperial British East Africa Company administered the territory which was later to become Kenya from 1888 to 1895, when the territory became a British protectorate. Between 1890 and '94, the Company issued a set of seventeen stamps picturing a sun and crown, symbolizing "Light and Liberty" (Scott #14-30). 1,500 sets were issued, and Scott '12 prices the unused set at $752.50 . Most of the stamps in the set had printings in the mid-10,000s, but the two key stamps, the 8a Gray (Scott #24 ; CV=$350.00) and the 1r Gray (Scott #26; CV=$275.00) had printings of 1,500 and 2,400, respectively. I recommend either purchase of the complete set, if found in F-VF or better, LH condition, or the key stamps individually. The set represents a conservative investment based on the growth of British Commonwealth collecting alone, but should a significant collecting population develop within Kenya, it will do very well indeed. A nation of 41 million people, Kenya has the largest GDP in East and Central Africa. The country traditionally produces world renowned tea and coffee, and more recently has become a major exporter of fresh flowers to Europe. It is generally perceived as Eastern and Central Africa's hub for financial, communication and transportation services, and has a service industry driven by a steadily growing tourism sector. Annual GDP growth has averaged about 5% over the past five years. 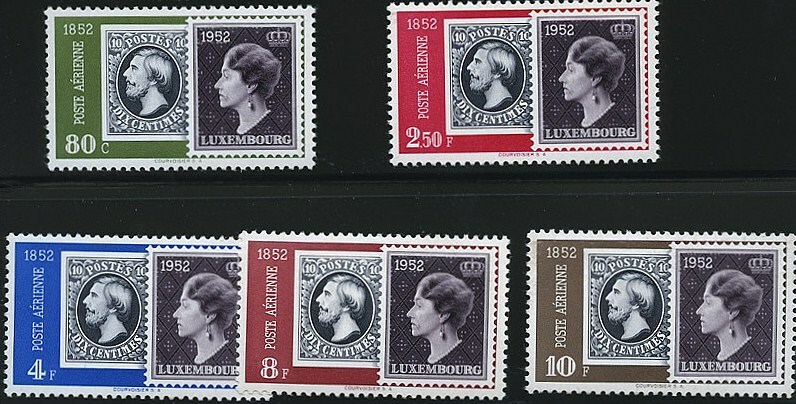 In 1952, Luxembourg issued a set of five airmails commemorating the centenary of its postage stamps (Scott #C16-20). 37,416 sets were issued, and Scott '12 prices the unused set at $55.30 ($100.00 for NH). 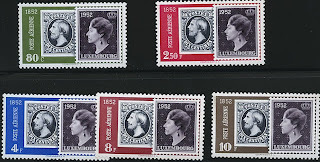 Stamps-on-stamps topicals are very popular worldwide, and although Luxembourg is a small country, its stamps are widely collected, especially in the Benelux countries. A nation of about a half a million people, Luxembourg has a highly developed economy, with the world's second highest GDP per capita. Its stable, high-income economy features moderate growth, low inflation, and low unemployment. The industrial sector, which was dominated until the 1960s by steel, has diversified to include chemicals, rubber, and other products. During the past decades, growth in the financial sector has more than compensated for the decline in steel. Services, especially banking and other financial exports, account for the majority of economic output. Annual GDP growth has averaged 2.3% over the last 5 years, despite a major recent contraction due to the global financial crisis. 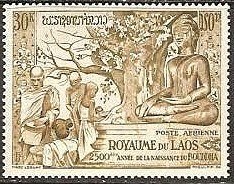 In 1956, Laos issued a compound set of five stamps celebrating the 2,500th Anniversary of the Birth of Siddhartha Gautama, otherwise known as the Buddha (Scott #27-29, C20-21). The printing quantity is not known for this set, but it was probably in the low ten thousands, and Scott '12 values it at $72.00 . Laotian stamps of the '50s and early '60s utilize beautifully engraved designs, a tradition inherited from the French which is characteristic of many of the stamps from their colonies and former colonies. The Buddha's Birth Anniversary set has multiple appeal, among collectors of French Colonies/Area, Indochina, Laos, and Buddhism Topicals. 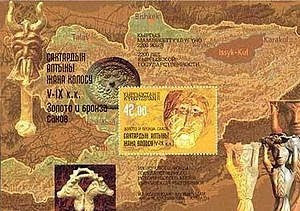 In 2003, Kyrgyzstan issued a souvenir sheet picturing Kyrgyz artifacts found by archeologists (Scott #205). Only 3,000 were issued, and Scott '11 prices the unused sheet at $10.00 . The miniature sheet is a very scarce Art topical, and I believe that focusing on scarce popular topicals is a prudent means of speculating on stamps of the newly independent nations of Central Asia. Whether or not demand develops within these countries for the stamps that they issue, there will always be worldwide demand for their most popular topicals. A nation of 5.5 million, Kyrgyzstan is the second poorest country in Central Asia. It has had economic difficulties following independence from the Soviet Union, as a result of the breakup of the Soviet trading bloc and resulting loss of markets, which impeded the republic's transition to a free market economy. Agriculture is an important sector of the economy, and the country also has substantial deposits of coal, gold, uranium, antimony, and other valuable minerals. In addition, the country's plentiful water resources and mountainous terrain enable it to produce and export large quantities of hydroelectric energy. Overall, the government appears committed to the transition to a market economy,and economic performance has improved considerably in the last decade, although the country was hit by the global financial crisis in the last two. Annual GDP growth has averaged 2.8% over the last 5 years.